Two is always better than one, right? 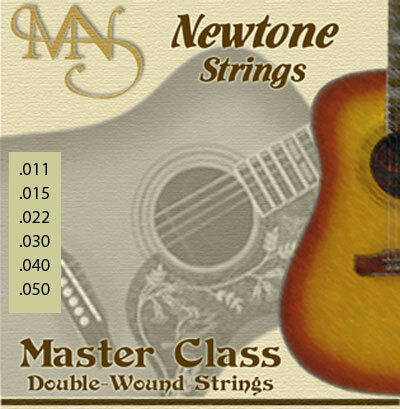 Well, it's definitely true with the Newtone MCDW-11 50 Master Class Double Wound Acoustic Guitar Strings. Artisans in England hand wind these strings twice—yes, twice—with Phosphor Bronze, creating a smoother feel and less finger noise than strings just wound once. Did we mention that these strings also have a warm, mellow tone? And that Newtone uses a round core, not a hexagonal core? And that the strings sound really, really great? A tip: As with all Newtone strings, don't cut these until you've secured and tuned them. Strings were on backorder so I purchased them anyway. No problem came before the delivery date. Excellent site easy to use. I've been playing guitar for about 25 years. Recently have tried these on my Composite Acoustics Cargo and now these are the only acoustic strings I will use. Strong on fundamental and very rich sounding. Almost piano like. These strings are fantastic and well worth the money.